Originally appeared in the "Supplement to the New Version of the Psalms," 1703, by Tate and Brady. And filled the plains with light. And never more shall cease. This carol usually occurs as one with six stanzas of four lines with a two line refrain. and fill'd the Plains with Light. and fill'd the fields with Light. However, the version of 1745 was restored in the 1781 edition according to Douglas J. Maclagan, The Scottish Paraphrases: Being the Translations and Paraphrases in Verse of Several Passages of Sacred Scripture. (Edinburgh: Andrew Elliot, 1889), pp. 110-111. 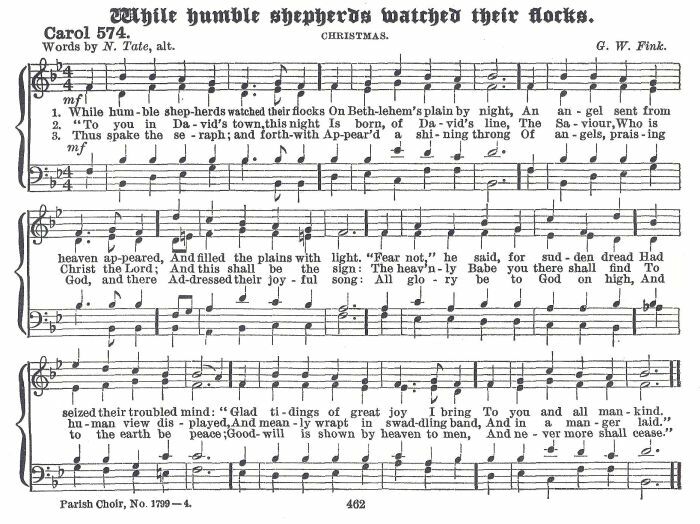 Also occurs in Scottish Psalms and Paraphrases as hymn #37 with six stanzas of four lines. 1. The authorities are in disagreement as to the year of the first appearance. Some say 1700, at least one says 1702, and Rev. Hutchins and Mr. Maclagen say 1703. I have not seen any of the three Editions.